Apparel related to SCP-3776, recovered from a thrift store in Charleston, WV. Special Containment Procedures: Thrift stores, garage sales, and other secondhand markets in Appalachia are to be consistently monitored by Foundation agents for signs of SCP-3776 activity. Should any artifacts related to the anomaly be discovered, they are to be seized and cataloged at Site-77. Subjects affected by SCP-3776 have been found to be resistant to amnestic treatments. As such, they are to be placed within an organization such as the Witness Protection Program and removed from the region. Once removed, memories and desires connected to SCP-3776 will fade over time. Description: SCP-3776 designates an anomalous phenomenon affecting much of the Appalachian region of the United States. All activity centers around an as-of-yet undiscovered recreational facility, "Camp Nimrod", which all recovered items indicate may have existed in the mid-1970's. 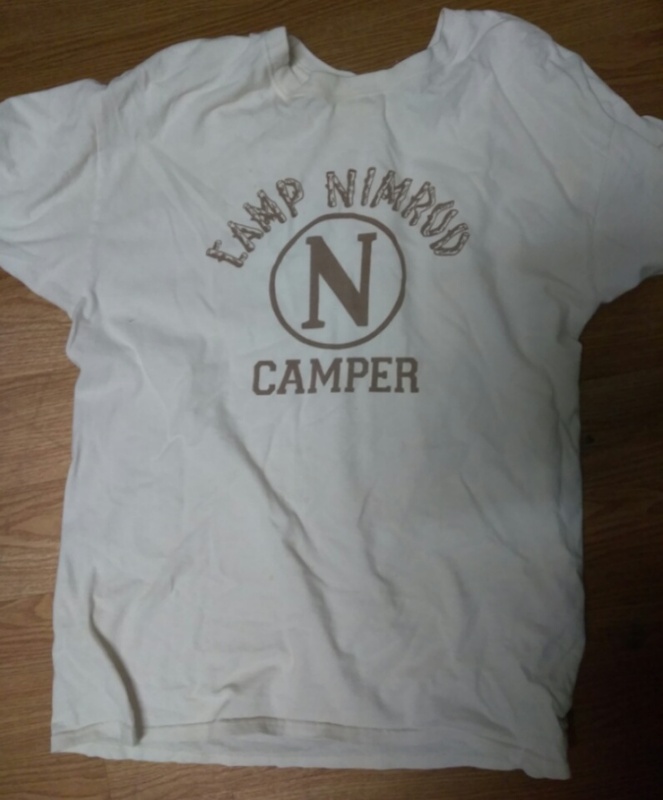 Objects with iconography or other relation to Camp Nimrod, such as shirts, banners or craft projects will manifest in retail outlets selling secondhand clothing or items. Analysis of CCTV footage shows that these objects do not come into the stores from the outside and only appear once the merchandise has become available to purchase. Always placed in obscure locations, such as the bottoms of bins, it can take months or years for the items to be discovered. Physical contact with these objects causes vivid and detailed memories to manifest within the conscious thoughts of affected subjects; these memories center on time spent as an adolescent at a summer camp called "Camp Nimrod". Subjects describes the camp as having wooden cabins and being placed at the edge of a lake with a creek running to it, along with various camping activities such as tubing, archery, crafts and general roughhousing in the wilderness. Attempting to inquire about specific details such as location and the length of time camp lasted will be met with an apathetic or hostile response. Once a subject has been affected, a sealed cardboard container will appear in the attic of the last building where the subject's biological parents lived independently. If an individual other than the subject opens the box it will only contain ashes and a significant number of living Periplaneta americana (palmetto bugs). Should the subject open the box, it will contain numerous memorabilia related to their supposed Camp Nimrod experience. Beads, apparel, and other trinkets are usually found, along with various forms of media. Photographs are the most common format in all recorded cases. Depending on the individual's age there may also be videotape, film reels, and music sheets, along with sketches done in their hand. All of these feature the subject in some fashion. A yearbook-style group photo is present in most cases. These will all show signs of age- and exposure-related degradation. Elucidating the location of SCP-3776 through these objects has not proved to be viable. Any identifying information such as street signs, vehicle license plate numbers, or migratory wildlife will have been lost through apparently natural aging and decay. All letters have had the recipient's address faded past legibility. However there will always be enough information for the subject to reach out and contact individuals they remember attending SCP-3776 with. In almost every case these individuals will be geographically close to the subject. All have been found to have existing knowledge of SCP-3776. This outreach is the second most common vector for spreading SCP-3776's effect. Many of the SCP-3776 subjects are impoverished, with some being addicted to opiates or alcohol. Research has ruled out any relation to SCP-3776's effect, as it is not universal among all affected individuals. Should two subjects afflicted by SCP-3776 begin to converse, their mental faculties will degrade abruptly as the conversation progresses. It has been found that multiple conversations of any length result in the brain entering the beginning stages of dementia. The corresponding bodily degradation will not be acknowledged by these subjects on their own; if questioned, they will attribute it to "old wounds from camp". Continuing to seek out information and persons related to SCP-3776 will accelerate this effect. Many subjects will perish either from their weakened condition making them vulnerable to illness, organ failure in the brain, early-onset dementia, and a few cases of disappearing into the wilderness looking for Camp Nimrod. Foundation attempts to locate a physical location corresponding with the camp have not been successful. Although several abandoned campgrounds have been discovered, none of these were recognized by the SCP-3776 subjects. Addendum: On 09/18/1999, Foundation personnel intercepted reports of an individual who claimed to have been a camp counselor at Camp Nimrod. After seizing and altering the public records which had alerted them, Agent Ekblad was dispatched to an abandoned grocery store in Hurricane, WV, where the individual was identified and interviewed. Interviewed: █████ ████, US citizen and West Virginia resident. Interviewer: Agent Ekblad, of Mobile Task Force Psi-7. Foreword: Interview took place in an abandoned grocery store, which public records indicate was owned and operated by █████ ████ until 1990. It is believed the subject had been living inside the building since its closure. Subject was discovered bagging and un-bagging expired canned food and rotten fruit into a paper bag, and continued this activity throughout the interview. Agent Ekblad: Hello? Can you hear me? The door was open, and I let myself in. Agent Ekblad: Excuse me? My name is Calvin, I'm with the state. Your living conditions, frankly, are… appalling. Do you understand what I'm saying? I want to help you, we just need you to answer some questions first. █████ ████: Yes, yes, inaudible. We've got to get out of this place. it's not right. █████ ████: But, it's… we're here. I'm just packing this up for you. Can I help you with anything else? Agent Ekblad: Oh, but… mister, I don't need that bagged. I have my own. I just want to talk. █████ ████: Can't you help me? We've got to drop it — her — I've got to drop her off. Agent Ekblad: Who are you talking about? █████ ████: To go to camp… I did it, when I was a young. Oh, when we swam up in the creek. I always thought somebody would drown there. Told stories to the littler things, the littler kids. Little ones. We always made them… inaudible. I'm sorry, I'm sorry, I'm trying. Agent Ekblad: Are you referring to Camp Nimrod? █████ ████: Oh boy, those were the salad days. So many of them, that's where we started. Camp is like a habit, when you keep going back. A lot of kids started… inaudible… started using it. Like a camp. They blistered and wilted in the sun. Agent Ekblad: Can you remember who any of those kids were? Do you know their names? █████ ████: Are you for… are you kidding me? What are we doing here? Why am I doing here? There's so much to… paper or plastic, sir? Agent Ekblad: You were mentioning a girl earlier. Do you know her name? █████ ████: Oh! Subject knocks bag over, sending cans spilling onto the ground. Several popped open, spilling rotten contents across the floor, which emitted a strong odor. Summer is over! We've got to… inaudible, subject slumps over onto table. Agent Ekblad: Hey, stay with me here. Who are you talking about? █████ ████: Summer is over… my… my little girl, I've got to get here. School is starting soon. It's our… bicep… ten… annual. She's going to make so many friends. Summer is over. Summer is over. Summer is over. Summer is over. Subject repeated this until Agent Ekblad retreated from the building. Closing Statement: Multiple broken and empty picture frames were found in a room on the building's second floor, along with two soiled cushions and a stained pink ribbon. Other than this, there was no evidence of anyone inhabiting the building other than the interviewed subject.